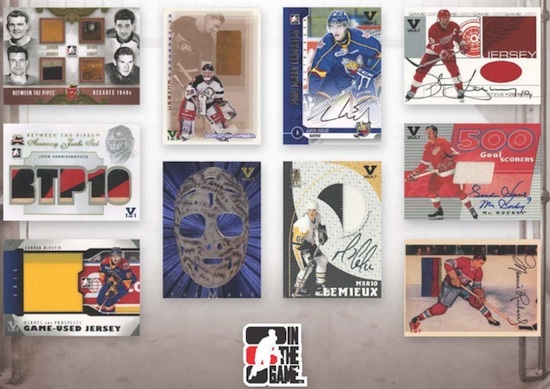 Combining plenty of previous ITG releases into one product, 2016 ITG The Final Vault Hockey looks back with a hit-centered format. Each box includes four autographs and five game-used memorabilia cards. While the cards are from earlier In The Game sets, each of the cards is stamped with the Vault logo to help distinguish it for collectors. All of the Game-Used Memorabilia cards are also stamped with one-of-one notations. Autograph print runs vary. 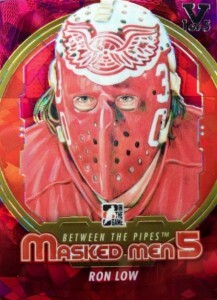 In addition to the nine hits found in each box, collectors will also find one The Mask card that features a striking design. These cards are available in three different versions and numbered as low as one-of-one. Collectors will also find bonus hits in random boxes that feature cards produced for previous products, but were never actually released because of production or timing issues. The unreleased cards will be the 11th hit in these boxes and will be the only cards that aren't stamped. As noted by Dr. Price on his blog, every box is intended to give collectors of The Final Vault great "bang for their buck.” The release comes from the reacquisition of assets that were originally sold off when ITG was purchased by Leaf. Price also revealed that a portion of profits from The Final Vault will be donated to the Make-A-Wish Foundation. This is a preliminary checklist. The full checklist will be added if it is made available. Every card is stamped with Black V Vault. Total print runs vary. Every card is stamped 1/1. Foil color dictates total cards for each. Every card is stamped. Foil color dictates total cards for each. Previously unreleased cards from earlier products. These cards are not stamped. All the cards were great but I can’t believe that I don’t have the money to buy them. And I love them all so much. Are thereally going to be any itg ultimate in this product? Will they be slabbed? Going by my excitement level for this product and past experience with ITG products. I am rating it 5 stars. I hate to see them change hands as they have had some of the sickestest patches ever released. I will give a review and let ya know what I got tomorrow when I open somewhere between 1 box and 1 case. I opened a case of ITG Final Vault. This is probably one of the safest products to break out there. It may not have the ultra high ceiling of hitting a Connor McDavid /5 so if you like chasing long odds this probably isn’t for you. That being said this product also probably has the highest floor. 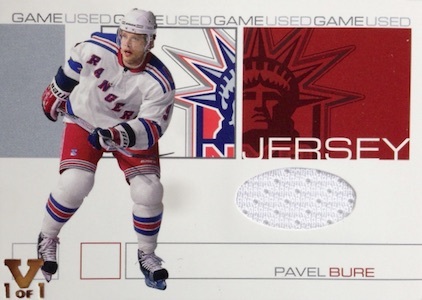 Each pack you get four autos, a mask insert and five jerseys – I don’t know of another product where you are getting auto/jerseys at about $10 per. I had a lot of fun with my first case and may end up going back for another. I bought 4 hobby boxes, and I got a Yzerman auto, Lehtonen auto, Gilmour auto, and several 1/1 prospect jerseys of stars, great players, not just retired prospects. Like Tarasenko, Jagr, Bourque and many many more. 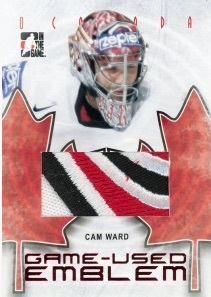 I have never collected a set in my life, I own over 150,000 cards but am thinking this is the set I would want to collect! All of it may take a while, but what a Final Vault! Opened my first box last night and I will definitely pick up a few more boxes. Very good hits and variety in the box. It’s a nice change of pace from opening the standard boxes and building sets and hoping for a hit or two. Great chance to find some impossible to find -cards. Opened two boxes and loved it all. Opening a pack is quite thrill with excitement high. I would rate this product no higher than 2 stars. I opened a couple of hobby boxes and probably didn’t even break even. The 1/1 stuff is misrepresented by Dr. Price. They are not true 1/1 thus have no reason to be stamped 1/1 very misleading to say the least. I read the color of the V stamp determines the rarity of that card. So how do we have a 1/1??? This is an awesome product for those who watched (and enjoyed) the players of the 70’s, 80’s, and 90’s. Yes, there are some current stars in there but the focus of this product is nostalgia. I loved pulling some of the more obscure players of yesteryear! The reasoning behind my “average product” is that this is not for everyone, especially those who are looking for monetary value. I broke 3 of these boxes. One was really nice (Yzerman on card auto), one was average (Dino Ciccarelli rookie jersey auto gold /1 from the decades 80’s set – I loved watching this guy play, probably my favourite pull from this) and one not so great (a Kevin Weeks uncirculated auto). There were more highlights! If you can find this stuff for under $100 CDN (good luck), buy it! 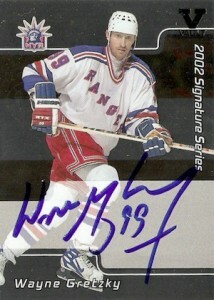 There are way too many Heroes and Prospects and signature cards in each box of little known players. Pulled a Gump Worsley auto and enshrined HOF stick which was great but overall the cards are just average in selection and value.